With several French restaurants and legends like the chef Gabriel Rucker already in residence in Portland, Ore., the city might not have expected the arrival of a newcomer, Bistro Agnes. But Greg Denton and Gabrielle Quiñónez Denton, the couple who won a James Beard award for their Argentine-inspired restaurant Ox, believed that Portland had lacked French classics for a few years. They wanted to create, in their former SuperBite space downtown, a Parisian-style bistro with dishes like coq au vin, escargot and sole meunière. No modern riffs here: The menu is old-school. After a lukewarm reception of their small-bite concept at SuperBite, they decided to pursue their passion. They added a brass rail in the dining room, bought an absinthe drip and hung a Jules Chéret lithograph. Bistro Agnes opened in January, and tables have been full ever since. The dining room feels both French and Northwest, a classy bistro far removed from the nearby streetcar and freeway. On a late-summer evening, I met a friend there for dinner. Cavalier King Charlie (a purple cocktail) set the mood, French flag toothpick on the rim. A photo of Mr. Denton’s grandmother, Agnes, graced the beverage menu. We ordered two of the lighter starters from 14 options. The local salmon carpaccio — cured and cold-smoked in-house — came with crunchy cucumber rounds, radish shavings, endive chunks, fresh dill and house-cured salmon roe. The plate was a lovely palette of orange, fuchsia, green and white. Red and yellow heirloom tomatoes were sweet and juicy from the summer sun. Tarragon leaves and roasted Oregon hazelnuts added punch. A generous croquette of goat cheese from Briar Rose Creamery nicely complemented the tomatoes. The duck confit was divine — crispy on the outside and almost melted inside — atop ratatouille, roasted potatoes and fresh basil. A whole, housemade fennel-duck sausage accompanied the confit. Beef short rib bourguignon was the star. Highlighting the Dentons’ skill in traditional methods, this dish takes three days to make. 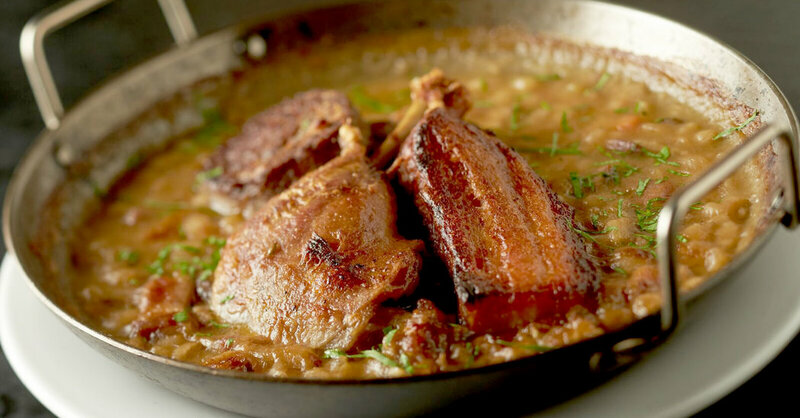 The result is super tender meat with mushrooms and lardons in an unbelievably intense gravy. We were happy to find a 2006 Bordeaux by the glass on a wine list that skews Old World. The spirits menu runs 10 pages, not including a separate absinthe sheet. For dessert, we chose a riz au lait — creamy pudding with risotto-style rice and vanilla bean, drenched in salted caramel and dotted with almonds and fresh nectarines — which the Dentons say they order every time they go to Paris. Unfortunately, the service did not match the quality of the food. Our server was inattentive, and his timing was a bit off. Nevertheless, the meal was outstanding. Bistro Agnes, in the middle of my hometown, captures the old-school magic of Paris. Bistro Agnes, 527 Southwest 12th Avenue; 503.222.0979; www.bistroagnes.com. An average dinner for two, without tip or drinks, is about $110.